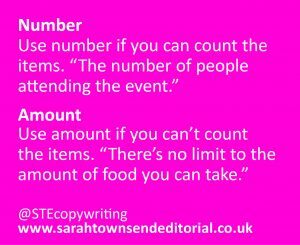 You probably know there’s a subtle difference between number and amount – but could you use a simple tip to remember it each and every time? To start with, it can help to know that things you can count are called count nouns, and things you can’t count are called mass nouns. Simple as that: if you can count it, use NUMBER. If you can’t, use AMOUNT. The same rule applies for LESS and FEWER, which are equally commonly confused. Once you know this, you can apply the same logic to MANY and MUCH. Too MUCH confusion can prevent customers from buying your products.